A rare bird specie flies over urbanized Metro Manila. 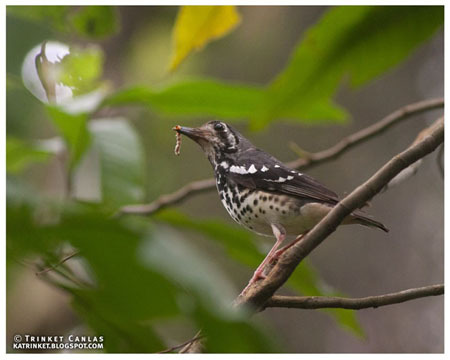 Known as Ashy Thrush Zoothera cinerea, the bird was discovered by a group of birdwatchers around the vicinity of the La Mesa Ecopark (LME), a 33 hectare public park within La Mesa Watershed in Quezon City. The group accidentally spotted Ashy Thrush late last year while looking for Red-bellied Pitta Pitta erythrogaster that had been reported to be in the park. Ashy Thrush is a small, elusive, ground dwelling thrush whose natural habitats are on subtropical or tropical moist lowland and mountain forests . This bird is very uncommon that Wild Bird Club of the Philippines' Records Committee only recorded 56 sightings from 2004-2009 at merely seven sites including Mt. Makiling. At least five Ashy Thrushes have been recorded in the LME since its first sighting. Birdwatchers were able to observe and document up close the behavior of the bird such as gathering of food, feeding and nesting.